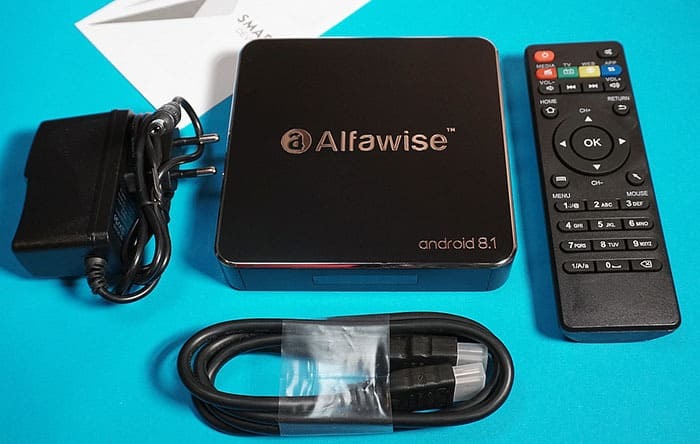 The Alfawise name has been around with several Android Boxes at all price points. One of their new entries is the Alfawise A8 which boasts the latest Android 8.1 Oreo operating system. It serves as a very basic Android TV box with just the essentials needed to view streaming video and a few games. To date, this is the cheapest Android A8 box on the market but it doesn’t skip on the essentials. Android 8.1 was announced as the next update after the release of Android 8.0 Oreo. It’s an incremental improvement that’s more of a maintenance update than a feature release. Principally, 8.1 fixes many of the bugs that irritated 8.0 users and provides a more stable environment. This update takes advantage of Google’s new Neural Networks API, which allows applications to utilize hardware acceleration, reducing latency and network loads. The result is better performance from entry-level hardware that, in some cases, can put an inexpensive chipset closer to the performance of higher-cost hardware running Android 7.1 or below. Android 8.1 also allows for this console to be started in PIP or Picture-in-Picture mode. This allows you to run two apps simultaneously with one app floating over the other app. Currently, there are only a few PIP apps like YouTube, VLC for Android, Google Duo, voice navigation in Google Maps, video calls in Whatsapp and a few others. More apps that take advantage of PIP are sure to be on the way. 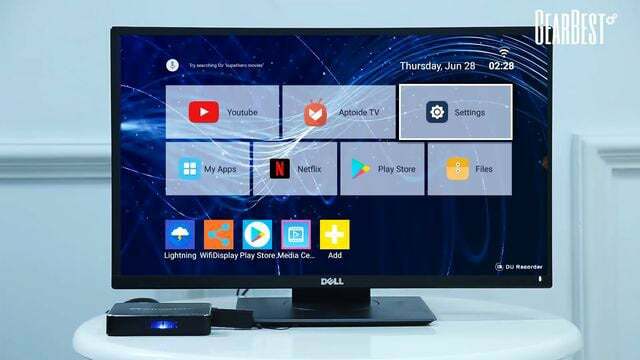 Alfawise has been around for some time and has several Android TV boxes with varying configurations at price points ranging from entry to upper-level performance. The Alfawise A8 is a base model with attractive features for the novice IPTV user. It has an attractive, compact design with the necessary basics to get started enjoying IPTV. This low-end box packs quite a bit into a small economical package. You’ll find the usual assortment of ports like RJ45 100mb Ethernet, HDMI 2.0, and SPDIF coaxial audio. The analog A/V output can breathe new life into older, dumb TVs. There was one feature, in particular, that was a welcome surprise. Most Android TV boxes have two USB ports which can be frustrating if you try to attach more than two add-ons like a wireless keyboard, external storage drive, etc. The Alfawise 8.1 has 4 USB ports; more than most entry-level boxes. The box has a black matte top with glossy black sides and chrome trim. It’s a compact design and the remote handles all the major functions. You get Bluetooth 4.0 and WiFi IEEE 802.11 b / g / n, a microSD card slot for up to 32GB of additional storage, and it supports 3D movies too. The compact size does not hinder cooling as there’s a large number of venting holes on the bottom. The Alfawise A8 starts quickly and we see a menu or launcher screen with all the major functions. There’s one-click access to YouTube, Netflix and Google Play Store. The main menu also features Aptoide TV…a Play Store alternative. The bottom row of apps can be customized to allow quick access to your favorite apps. The 2Gb RAM allows the A8 to move easily through the menus and the 16Gb ROM has plenty of room for storage. Downloading and installing apps is smooth with no issues. The installed YouTube app is designed for Android TV and plays in full HD. IPTV apps install easily and offer thousands of TV channels and VoD movies. The Google Play Store and Aptoide TV buttons will let you choose from thousands of apps, most of which are free. With the addition of news, weather and sports apps you’ll have access to just about everything you need for TV viewing. And don’t forget the free games available too. Though this box isn’t primarily designed for gameplay, many games play smoothly nonetheless. You may have a little lag issue with more graphics intensive games which is understandable considering this is an entry-level box. The Kodi Media Center operates well and you shouldn’t have any issues with video playback. One noticeable absence is the lack of Dolby 5.1 support. Audio playback is clear and smooth but enthusiasts may miss the 5.1 experience. Overall, the Alfawise A8 performs well for home entertainment. IPTV users should have no complaint with this box and online streaming movie sites work well. External storage through USB hard drive or microSD card will allow you to record and save your favorite titles and most games will work as expected. The extra USB ports will give you plenty of room to connect your wireless keyboard, game controller, external drive, etc. Although the A8 is an entry-level box it is built to perform with the Android 8.1 proven Rockchip RK3229 and Mali-400MP2 GPU. The 2Gb RAM with 16GB ROM is a solid combination for both performance and storage. And, the 4 USB ports give you ample room for expansion. If you’re thinking of starting the IPTV hobby but don’t want to spend a lot of money on equipment, the Alfawise A8 would be a good choice. The small attractive design with room for expansion will serve you well. If you’re looking for an inexpensive option to dust off that old dumb tv and experience IPTV the A8 will do the job. In either case, this Android TV box will hold its own with any entry-level console out there and a very good value for the price. If you’re looking for a great deal on the Alfawise A8, GearBest has it on sale at just under $30 with reviewers giving it a 4 ½ star rating.